It wasn’t that long ago that the clothing category of athleisure was invented. Athleisure is defined as “a trend in fashion in which clothing designed for workouts and other athletic activities is worn in other settings, such as at the workplace, at school, or at other casual or social occasions. Athleisure outfits are yoga pants, tights, sneakers, leggings and shorts, that “look like athletic wear” and are characterized as “fashionable, dressed up sweats and exercise clothing”. But, Merriam-Webster notes the term became ubiquitous around 2015. For many investors, one company represents the trend and the stock of that company is on the move again. Bloomberg reported, “Lululemon Athletica Inc. Nasdaq: LULU) rose the most in more than four months after the yogawear company boosted its quarterly sales and profit forecast ahead of the ICR Conference in Orlando this week. The move follows a series of holiday sales misses last week and prompted a chorus of praise from analysts. “In what is turning out to be a more mixed holiday for retailers, we view these results as industry leading,” a MKM Partners analyst wrote. The company said comparable-store sales increased in the high-single to low-double digits for the current quarter, which ends Feb. 3. Lululemon also sees total sales and adjusted profit coming in higher than its previous forecasts. Lululemon’s guidance for stronger-than-anticipated holiday season stands out in the retail sector and highlights “continued brand resonance and execution through the important holiday season.” Duffy is “impressed by the magnitude of the upside” indicated by the pre-announcement. The company’s investments in data analytics and digital marketing will contribute to product margins in the long-term. This seems to be having a short term impact on the stock. And, the recent gains could mark a reversal in the long run. As with the ownership of any stock, buying LULU could require a significant amount of capital and exposes the investor to standard risks of owning a stock. For LULU, the February 15 options allow a trader to gain exposure to the stock. A February 15 $145 call option can be bought for about $5.90 and the February 15 $150 call could be sold for about $3.90. This trade would cost $2 to open, or $200 since each contract covers 100 shares of stock. In this trade, the maximum loss would be equal to the amount spent to open the trade, or $200. For this trade in LULU the maximum gain is $3.00 ($150 – $145 = $5.00; $5.00 – $2.00 = $3.00). This represents $300 per contract since each contract covers 100 shares. 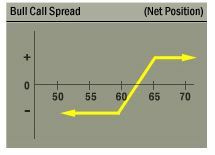 Most brokers will require minimum trading capital equal to the risk on the trade, or $200 to open this trade.